This post is a description of how neutrons produced in a fission reaction may be used to initiate further fission reactions – a chain reaction. Both power stations and weapons use a variety of nuclear ‘fuels’ – poorly named since a fuel is more usually a descriptor for a substance which burns and combustion is exothermic, releasing heat. A common nuclear fuel is uranium 235, which is the only naturally occurring fissile material. We should know that only low-energy neutrons (< 0.2 eV) favour nuclear fission. Unstable nuclei capture a slow neutron of low energy. Why are the neutrons ‘slow’? Because the U nucleus is said to have a large ‘cross section’ for slow neutrons – rather like using a big, oversized racket to hit a small ball – the probability of the ball being hit is greater. 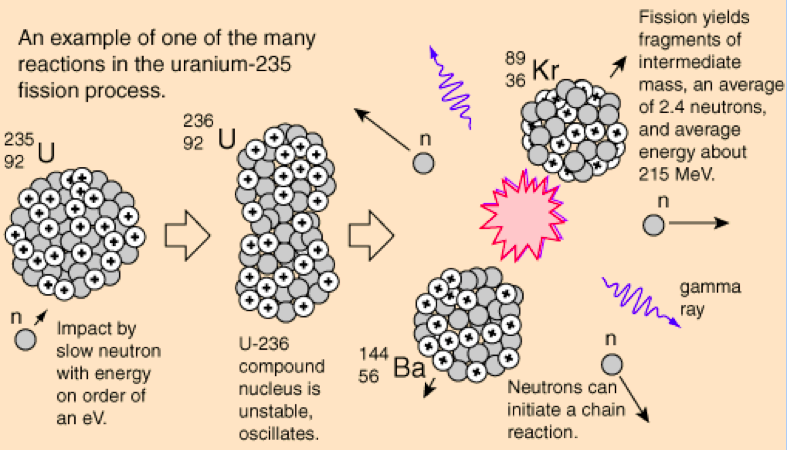 The U spontaneously divides into 2 smaller parts, approximately equal in size plus 2,3 or 4 more neutrons which may be captured by other nuclei, producing a chain reaction (see diagram). Unless this is controlled, if enough fuel is present (a 7kg ball is enough – the critical mass), the reaction goes out of control and basically becomes explosive. If the ball is too small, neutrons will tend to pass through it, we need enough uranium present to ensure that the probability of neutron capture is high. The mass of the fragments is less than the mass of the original parts, thus mass ‘loss’ and energy ‘gain’ are equivalent. [E=mc2]. This is one of a number of possible events. In a reactor for power generation, the KE of the moving fission products is converted into heat when passed through water in a very short time. Sometimes, we’re asked to find the average kinetic energy of the fragments knowing the temperature rise of a mass of coolant. is the process by which the percentage of fissile uranium 235 is increased. Uranium 235 as mined is about 0.7% by mass and much of the rest is U 238 as oxides and other more complex salts. Enriching by isotope separation, gaseous or thermal diffusion and centrifuging boosts this percentage to between 3 and 4% for reactor grade uranium and if the process continues, high purity weapons grade uranium requires almost 90% purity. A crude, inefficient weapon can be manufactured with a source of 20% or more, however. The control rods absorb the neutrons which keeps the reaction rate relatively constant (rather than letting it grow exponentially). They create a situation where roughly one neutron per fission goes on to cause another fission event. Silver, indium, cadmium or boron are commonly used to make them. Moderators slow down the neutrons without absorbing them. Fast neutrons are more inclined to bounce/deflect off of the surface of a nucleus so slower neutrons actually lead to a greater number of successful fissions i.e. moderators don’t slow the reaction down, they just help it to take place. Commonly-used moderators include regular (light) water (in 74.8% of the world’s reactors), solid graphite (20% of reactors) and deuterium oxide or heavy water (5% of reactors). Their job is to be introduced in controlled amounts into the nuclear pile (bundled fuel rods) to slow down neutrons and so increase the probability of a fission event. In the IB papers, you will be asked to answer questions using a particular form of words. ‘Describe’ isn’t the same as ‘explain’, for example. 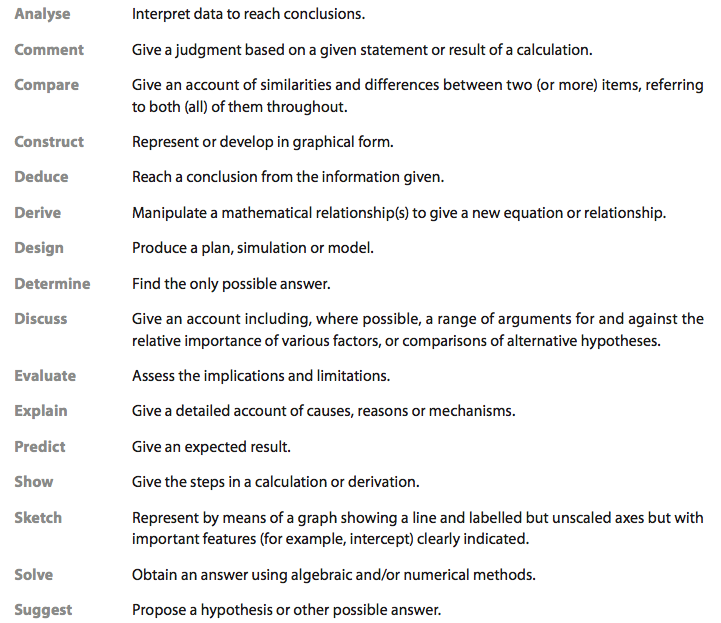 Here’s a list – the so-called ‘Objective 3 in the syllabus, plus a translation. Even people who know what they are doing fail to score because they’ve fallen into the trap of misunderstanding the question’s precise requirements. This screenshot should help. Remember, in paper 2 (HL) question 1 is always data analysis, often with a discussion of errors (see earlier post for more help). Please read and comment. Reblog from original site esfscience. IB exam questions sometimes ask you to think about the difference between accuracy and precision of a set of measurements. Ideally a measurement device is both accurate and precise, with measurements all close to and tightly clustered around the known value. The accuracy and precision of a measurement process is usually established by repeatedly measuring some traceable reference standard. Such standards are defined in the SI system – the whole community knows and uses the same standard values for metres, seconds and so on. The accuracy of a system of measurement is the degree of closeness of repeated measurements of a particular quantity to that quantity’s actual (true) value. The precision of a measurement system, also called its repeatability is the degree to which repeated measurements under unchanged conditions show the same result.